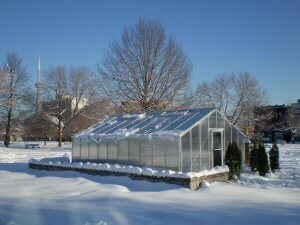 Backyard Greenhouses Adds Color to Your Garden - Even in Winter! Order any greenhouse from Backyard Greenhouses between now and January 15, 2010 and receive a free color upgrade to forest green or dark brown. Or, if you prefer a white greenhouse, receive the value of the color charge as a discount. You must take delivery of the greenhouse within 6 weeks of the purchase date. A 25% deposit is required on the date of purchase, and the greenhouse must be paid in full prior to shipping. You may choose to take advantage of our Greenhouse Layaway Plan. Place your greenhouse order prior to the price increase, locking in our 2008 price, place a 25% deposit and take up to six months to pay. The greenhouse must be paid in full prior to shipping. Please note that the Winter Color Special does not apply to Layaway orders that go beyond 6 weeks of the purchase date. Add a little color to your winter. Take advantage of this greenhouse special today. This is a limited time offer. Please call 1-800-665-2124 for your free quote. Please note that the Greenhouse Winter Color Special does not apply to the Sun Garden or Legacy Feature Greenhouse.